A special Thank you to Christy for her First review here at The Sweet Bookshelf! A chance meeting in a San Francisco cocktail bar sparks an instant connection between two opposites: Ivan, a man with an adventurous dream of finding freedom on the ocean aboard his humble sailboat, and Torre, a city girl with a morbid fear of deep water. As their bond turns to love, Torre realizes the only way to keep the man of her dreams is to embark on the voyage of her nightmares, so she waves goodbye to dry land and braces for a life-changing roller-coaster ride that’s as exhilarating as it is terrifying. Set against a backdrop of the world’s most beautiful and remote destinations, this sometimes hilarious, often moving, and always breathtakingly brave memoir proves there are some risks worth taking. This is my first review at TheSweetBookshelf and I'm so excited and honored to be doing this. Thanks Mary for asking me to be your American Correspondant! 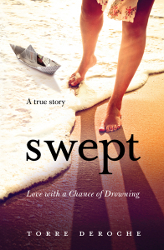 I stumbled across Swept Love with a Chance of Drowning while blog diving on the Internet. As an avid traveler I’m always on the lookout for blogs and books about adventurous souls. When I found Torre DeRoche’s blog (www.fearfuladventurer.com) and e-book, I couldn’t resist the impulse buy. And it was a great buy! I mean really, who could resist a hilarious story about someone with a fear of water who gets up the gumption to sail across the Pacific in an old sailboat with a guy she met in a bar? I’m a sucker for the ocean and quickly fell in love with Torre’s beautiful, relaxed writing style and great descriptions of life at sea. Her fear of deep water both cracked me up and hit close to home for me – I have a fear of dark water and all things that I can’t see in said dark water. But at the same time I long for and LOVE the ocean and would live in it despite that fear, if I could. If you like travel, romance, humor, sailing or if you’re just looking for a great tale about overcoming one’s fears and bettering life, you’ll LOVE this book. I laughed, I longed for the sea, I dreamt of the destinations in this story and lived out the adventures as I inhaled this book; It swept me away. NB: This book was available as a self-published e-book for a while. Miss DeRoche has just sold her book, and the movie rights and it is no longer available for sale. It will re-release in 2013 in both standard and e-formats. Seriously people, put this one in your Amazon pre-order bin. You won’t regret it! This looks like such a good book Christy! I'm not much on non-fiction unless it is something like Eat, Pray, Love and this seams like a good one! Thanks for the review! Why Give Books This Christmas?